Best service, state-of-the-art pumps and valves – renewable energy applications call for innovative, efficient and durable products. KSB has taken up this challenge. KSB has been producing pumps and valves for 140 years and has many years’ experience in power plant engineering. Thanks to high investments in research and development, KSB offers optimised hydraulic systems with high-efficiency drives resulting in very low life cycle costs and maximum performance. 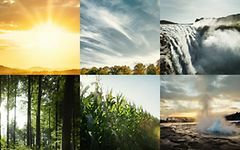 KSB is thus a reliable partner for all applications, offering optimum service in the field of renewable energy and supporting sustainable environmental protection with its products. KSB pumps and valves are ideally suited for use in wind power stations. All products are selected and designed to match the specific requirements. Biomass is one of the renewable energies and allows CO2-neutral power generation, as does waste incineration. It can be solid, liquid or gaseous. The use of solid biomass offers particular advantages because of its availability and base load capability. Geothermal energy is a promising energy source with practically endless potential. KSB pumps and valves must operate efficiently and reliably in these systems and also withstand extreme conditions. The Ivanpah Solar Electric Generating System (SEGS) – owned by NRG Energy, Google, and BrightSource Energy – uses BrightSource’s proven solar tower technology to produce clean, reliable solar electricity to more than 140,000 homes. Ivanpah is the largest solar thermal power tower system in the world. Located in Ivanpah Dry Lake, California, the threeunit power system is built on approximately 3,500 acres of public desert land.